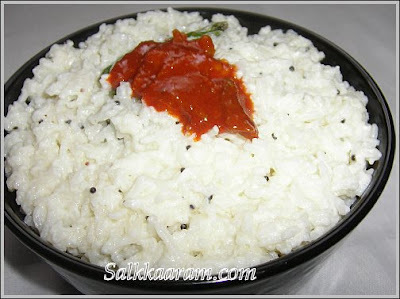 Curd Rice / Thairu Saadham | Simple and Delicious ! Thanks to all friends who sent me New year wishes, sorry for not responding to you all promptly. She told me to put this as my own recipe, but I don't want to do it.Read her own words..
That is, first cook rice(pachari choru okay, not motta chaval), after it becomes cold, add boiled and cold milk not the curd, mix well the rice and milk, after you mix well, add sufficient salt and a little curd(actually 75% milk and 25% curd to be added). Then do seasoning. I will write 2-3 types of seasoning. You try all these 3 methods first. 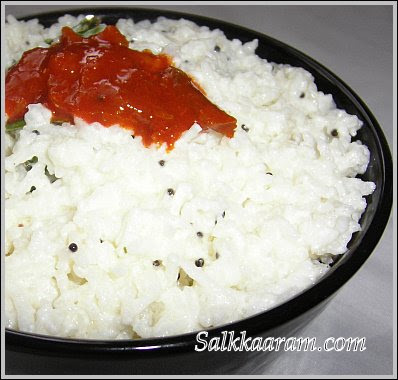 S will like all these curd rice.Any method you make, after seasoning and everything is finished, just keep it for 3 - 4 hours to set and then use it. It will be delicious! Wow...simple and yummy! Real comfort food. Hope you had a wonderful new year. Best wishes for a fabulous 2009, Seena. Looks great..never knew they use milk in it..
seena,so finally you are here..no wonder why you opted for this comfort simple food after a long vacation..it look awesome..and your friend is a friend indeed !! Hi Seena! Happy new year:) I like thairu saadham. thairu sadham nannayittund kettoo ....i love to have this with lemon pickle ...simple meal ..
My all time favorite. I can eat it anytime and manage my life with this alone. hahaha, just kidding. Looks yummy with pickle. Comforting food for a hot tired day! Yeah i was also on a break as it was holiday for shyama. I love curde rice with pickles , just hubby and daughter don't like them so i gave htem when i am alone for lunch. Which is never that often. Very simple and easy to make recipe. Good one to try.